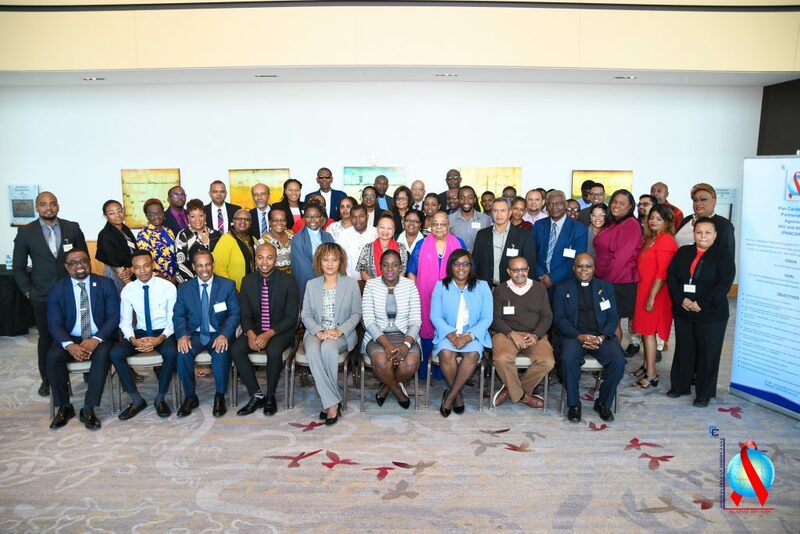 Tuesday, 24 April, 2018 (PANCAP Coordinating Unit, CARICOM Secretariat): The Pan-Caribbean Partnership against HIV and AIDS (PANCAP), the mechanism that provides a structured and unified approach to the Caribbean’s response to the HIV epidemic, commenced the Joint Regional Dialogue with Faith Leaders, Parliamentarians, Civil Society Leaders, National AIDS Programme (NAP) Managers and Youth Leaders in Port-of-Spain, Republic of Trinidad and Tobago with approximately 60 delegates. The meeting came two years ahead of the 2020 deadline for reaching the 90-90-90 targets—90% of people living with HIV diagnosed, 90% of diagnosed people on treatment and 90% of those on treatment virally suppressed. In his opening remarks, Director of PANCAP, Mr Dereck Springer stated that the meeting seeks to affirm the work done in response to HIV by stakeholder groups and individual organizations across the region. He explained that the five thematic areas for discussion include i) Access to HIV and Sexual and Reproductive Health Services including adolescents’ access; ii) Stigma and Discrimination against People Living with HIV (PLHIV); iii) Access to Justice and Redress iv) Gender inclusive policies and laws; and v) Comprehensive sexuality education in schools. The Director further explained that the aforementioned thematic areas were suggested by the stakeholders who participated in the various PANCAP consultations in 2016 and 2017 with faith leaders, parliamentarians, youth, key populations and NAP managers. He stated, “We must now build upon these outcomes by facilitating the collaboration and partnership of our five stakeholder groups to take collective action to end AIDS by 2030”. The PANCAP Director explained that the objective of the meeting is to move the stakeholders beyond information sharing and sensitization to discussing and agreeing on mechanisms or strategies for effecting harmonized and sustainable partnerships and collaboration between all stakeholder groups at the organizational, national, regional and international levels for ending AIDS. Mr Springer highlighted that the most significant objective of the meeting is the identification of realistic joint organizational, national, regional and international level activities that the participants can partner, collaborate and engage in to advance the PANCAP Justice for All Roadmap and the Model Anti-Discrimination Legislation which was approved in 2012 but which no country has to date adopted in whole or in part. He emphasized the need for respectful dialogue over the next two days. Dr Edward Greene former UN Secretary-General Special Envoy for HIV in the Caribbean, now PANCAP Special Advisor delivered remarks on behalf of Professor Donald Simeon, Chair, Priority Areas Coordinating Committee (PACC) and Deputy Chair, PANCAP Executive Board. Professor Simeon in his speech emphasized the importance of examining the effects of stigma and discrimination. He noted that as a Health Research Scientist, he understands the value of using differences for the greater good. He explained that by observing how and why a few individuals respond differently to a specific exposure, many critical hypotheses can be generated, leading to life-saving discoveries in the field of medicine. Professor Simeon challenged the participants to seize the opportunity and use their differences to strengthen the regional response against HIV. In her remarks, Hon. Nicolette Henry, Minister of Education, Republic of Guyana and Chair, PANCAP Regional Coordinating Mechanism commended PANCAP for creating a platform for collaboration among such a wide cross-section of stakeholders. “The dialogue has brought together a diverse group of advocates, experts, practitioners and stakeholders from across the region which is an embodiment of the commitment to achieve the internationally agreed targets for ending AIDS at national and regional levels,” stated Minister Henry. She further stated that the Dialogue provides an ideal opportunity to take stock and reflect on how far we have come, and how far we have yet to go. She urged participants to collectively examine the many challenges still faced by the Caribbean in ending AIDS such as the annual number of new infections among adults across the Caribbean, which has remained static for the last six years at an estimated 17 000 as reported in 2016. Minister Henry also highlighted that one-third (33%) of our Caribbean people living with HIV on treatment were not virally suppressed in 2016. “Additionally, retaining people on treatment has proven challenging for most countries in the region”, stated the Minister, “notably, of all people living with HIV in the Caribbean, 36% were unaware of their HIV status in 2016. And late diagnosis is still a challenge, particularly for men”. Minister Henry also advocated for collective action for domestic financing of the HIV response. “If we are to ensure sustainability of the regional response and for ending AIDS, many countries in the region have to do more to make AIDS and health a financial priority,” stated the Minister, “let me say also that sustainability is not just about resources. It is also about ensuring that our responses are the most effective, based on science and epidemiology, and targeting those most in need. Sustainability is also about partnership”. The Minister noted strong growth in the region’s HIV response, however, she warned that “more still needs to be done in order to sustain the response and the gains made”. The Hon. Ayanna Webster-Roy, Minister of State in the Office of the Prime Minister, holding the portfolios of Gender and Child Affairs, Ecclesiastical Affairs and Central Administration Services, Tobago, in her feature address commended PANCAP for convening the meeting and thanked participants for tackling the issue of stigma and discrimination with honest discussions. She said that initiatives such as this are imperative as the Caribbean has a long way to go to achieve a future free of AIDS. “As I look into the audience, I see a gathering of like-minded individuals who share a common interest for improving and sustaining the HIV and AIDS response within the region” stated Minister Webster-Roy, “It is through meetings like these that the realization of our future goal of ending AIDS by 2030 will be achieved”. She further stated that the Region has made significant progress to date. “The Caribbean has halved the number of new infections among adults between 2000 and 2014”, stated the Minister, “however, our work is far from complete, as we have existing and new challenges to address. With the world economic downturn and the pending withdrawal of two key international donors, the funding mechanism will be affected in some countries, and the participating organizations gathered today, will be tasked with finding innovative ways for addressing the needs for sustaining our response campaigns”. Minister Webster-Roy also challenged participants to examine national and regional issues and goals and to take into consideration the targets established by the United Nations High Level Meeting Political Declaration June 2016 on ending the AIDS epidemic by 2030; the 2030 Sustainable Development Goals approved by 192 nations at the United Nations in September 2015, and the commitments made by civil society, faith-based and other implementing stakeholder groups for ending AIDS. She indicated “if we agree that our aim is a future free of AIDS and a reduction in the number of new HIV infections and if we understand that the effective guarantee of Human Rights is essential for our Sustainable Development Goals, we must also recognize that open, honest and consistent dialogue and collaboration are paramount to the achievement of our national, regional and international goals”. The Minister emphasized that the region recognises that HIV is a critical development problem, which affects quality of life, labour, families, communities and the national economy in the present and the future. “Therefore, it is in your interest, along with all of our partners and stakeholders to ensure we all perform our critical roles in the care of persons infected and affected with HIV,” stated the Minister. The Minister stated that all stakeholders must ensure that they all perform their critical roles in the prevention of and protection against HIV infection, and the mitigation of the spread of the disease. “It is conversations like these, which allow everyone, including representatives from Governments, to efficiently and effectively support meaningful change that benefits the region”. The Minister reminded participants that CARICOM’s Vision Statement proposes a “Caribbean Community that is integrated, inclusive and resilient; driven by knowledge, excellence, innovation and productivity; a Community where every citizen is secure and has the opportunity to realise his or her potential with guaranteed human rights and social justice; and contributes to, and shares in, its economic, social and cultural prosperity; a Community which is a unified and competitive force in the global arena”. Minister Webster-Roy invited participants to keep this vision in mind as they deliberate and agree on joint national and regional level policy formulation and activities for advancing the short, medium and long-term goals of the PANCAP Justice For All Roadmap to chart the way forward. Minister Webster-Roy also pledged Trinidad and Tobago’s commitment to ending AIDS and removing barriers of stigma and discrimination despite the challenges currently faced by the country. “I pledge our commitment to creating an environment that is both respectful and supportive to all including those living with or affected by HIV” she stated. “These are goals that I wholeheartedly believe we can achieve if we continue to place HIV and AIDS at the forefront of issues facing the Caribbean”. The Minister underscored that the Joint Dialogue is another step in the correct direction for laying the foundations for increasing engagement and promoting solidarity among stakeholder groups as well as the persons they serve. It is intended that the two-day Dialogue will culminate with practical and strategic initiatives for collaboration by all stakeholders under the PANCAP Justice for ALL (JFA) Programme for ending the AIDS epidemic.